In ‘I have nothing to declare but my networking skills’ (Eye no.70 vol. 18), Deborah Littlejohn argues that ‘creative genius’ is so last millennium. 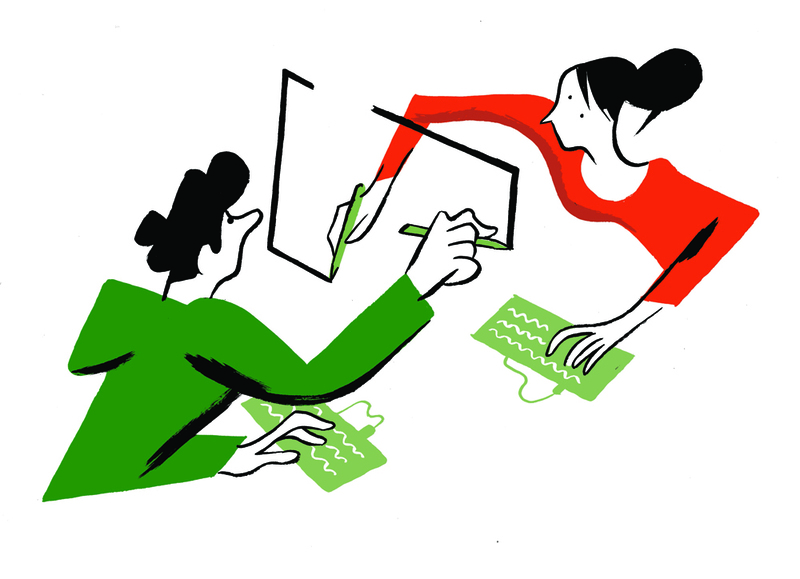 What design students want – and need – is skill in collaborative online technology. Such scenarios privilege the artefact – and the techno-formal issues in making it – over the contexts in which design is created, disseminated and interpreted within the culture. Yet current research into learning and creativity backs up Henry Jenkins’ argument that this ‘falsifies the actual process by which meaning is generated and new works produced. Most of the classics we teach . . . are themselves the product of appropriation and transformation’ (‘Confronting the Challenge of Participatory Culture: Media Education for the 21st Century’). Within most modern graphic design curricula, students still learn their field by understanding its particulars as discrete elements. Graphic Design (1, 2 & 3), Typography (Beginning, Intermediate, Advanced), Identity Design, Packaging Design, Web Design, and Senior Projects are courses labelled to describe designed objects, while ignoring the complex skills necessary for their creation and production and the situated contexts in which they reside. Equally telling, design pedagogy is focused on the individual student, who is identified, praised and graded as being the sole author of his or her own creative production, and therefore typically works in isolation – usually in front of a computer – without much reference, influence or supporting frames of reference. Such a limited approach not only ignores the day-to-day reality of most design practice – where colleagues, clients, marketers, vendors and various other professionals may also have a say in a design’s development – but is ignorant to the substantial insights gained from recent research into the ways in which people learn through teamwork, inter / cross-disciplinary collaboration, and authentic problems situated in real-world settings that employ technology as a means of connecting with others. And considering the computer as just another production tool can only be to the detriment of design education, because it ignores most of what is happening between people and these networked technologies. Along with a do-it-yourself Zeitgeist, participatory technologies – such as reputation software, recommender systems, group knowledge repositories, peer-to-peer media sharing, and interactive online games – are changing the way people solve problems, ask questions and work together to create, communicate and learn. Look at Wikipedia, the online encyclopedia written collaboratively by volunteers; Amazon’s Mechanical Turk, which allows businesses and developers to post ‘human intelligence tasks’ (hits) and catalyses ‘workers’ to accomplish them; the Google Earth search for the explorer Steve Fossett which had individuals all over the world studying satellite images of the Nevada desert; ‘open innovation’ marketplaces such as InnoCentive and NineSigma, which match problem-solvers with solution-seekers; and non-profit initiatives such as ThinkCycle, which matches the needs of NGOs with design schools around the world. Online collaborative tools are fostering new literacies and social behaviours. In the near future, students entering design education will be of a generation weaned on multidimensional, interactive and participatory media, with an understanding and expectations of the world that will differ profoundly from that of the generations preceding them. This demographic shift heralds far-reaching, systemic challenges for our educational system (see www.kwfdn.org/map/). More than half (64 per cent) of Americans aged 12–17 use online social networking sites. 57 per cent of US teens who use the internet create content and share it with their friends online. Nearly half (47 per cent) of online teens have posted photos open for viewing by others, and 89 per cent of those say that people comment on them at least ‘some of the time’. ‘Super-communicators’, with a host of technology options for dealing with family and friends, including landline phones, mobile phones, texting, social networking sites, instant messaging and email, represent about 28 per cent of the entire us teen population. 81 per cent of teens who access the internet play online games. These technologies allow students – and laypeople – to participate in the kind of creative work that was once the domain of the fully trained artist, musician, poet, filmmaker, and designer. Such widespread participation demands that designers think of their audiences not simply as consumers and users, but as participants and co-designers. The educational equivalent of this notion also requires educators to think of students differently. The ways students use digital technologies are fundamentally different from how they are taught in the design studio. Implicated herein is the practice of teaching primarily through one-on-one ‘desk crits’ – what design educator Cal Swann derogatorily refers to as the ‘Sitting by Nellie’ approach, which often results in design instructors explaining their personal experiences in order to improve the students’ work. Conversely, by motivating students as active participants in learning, who construct knowledge collaboratively with their peers – rather than relying upon transmissive teacher-to-student approaches that create what Fischer calls ‘passive, consumer-learners’ – co-operative technologies reduce the focus on isolated learners. Such collaborative practices are not just about learning how to master participatory technologies as a means to personal expression; they should also be understood as social skills that enable engagement within a larger group or community. The implications of participatory technologies for the practice of design will be long-term, far-reaching and are already being felt – though they are only beginning to be understood. What these developments mean for design education has barely begun to be addressed. ‘The informal participatory communities of fans and gamers are where digital natives already congregate when they seek out knowledge – not the traditional classroom where learning is seen to be static, provisional and bureaucratic,’ Jenkins declares. His cautionary report that schools tend to educate only individual problem-solvers – even though students entering the workplace will be asked to work collaboratively in teams, drawing on different sets of expertise – is as valid to design pedagogy as it is to education in general. Digital technologies allow anyone with access not only to peer behind the curtain of the mysterious creative process but to experiment with it, and even appropriate the creations of others, first hand. Pierre Lévy’s notion of a problem-solving, democratic ‘collective intelligence’ is already a reality on the Net where most of tomorrow’s designers now engage with creative culture. When this group enters higher education, they will not leave their online communities and collaborative skills at the door. There will always be a symbiotic relationship between design and the technologies used to support the creation of artefacts. Nevertheless, once connected digital technologies are introduced in the design studio – as they were in the 1990s – a new way of (net‑)working and engaging with design’s communities of practice is possible. Consequently, design education requires a new approach that imparts relevant knowledge and skills in partnership with these technologies – technologies that take advantage of a classroom that exists beyond the academy walls and position the design student as a part of a broader community of learners. From this perspective, students are not just individualised learners, the computer is not just another production tool, and the classroom studio is not a self-contained entity where students acquire knowledge to be applied later outside in the ‘real world’. This type of connected pedagogy can be envisioned as a part of a wider network of learning, fostering engagement with the field that continues long after students receive their diplomas. The design classroom and its curriculum of projects, critiques and comps still have a crucial role to play in such a context, but they have to be connected with what students already know about in their world. This article is based on research from the KnowledgeWorks Foundation (kwfdn.org).